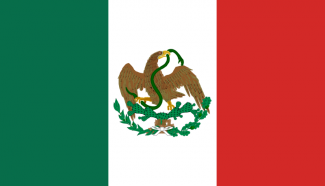 Mexico is a secondary power in North America. Mexico has a high immigration rate, and plenty of gold. Unfortunately, Mexico starts at war with Texas where USA has the possibility to intervene and Mexico has an inadequate army. In addition to these issues, Mexico controls area where cores of the United States of America will be created after Manifest Destiny, which usually leads to a war that Mexico will lose without wise leadership. Mexico has the unique decision Restore the Mexican Empire, which changes the government to HM's Government instead of Democracy. It has both Mexican and Mayan as accepted POPs. One have to balance Mexicos budget with education, military and Navy being the main expendures. It is advised to spare on the navy, possibly disbanding. It is advised to place the two National Focuses on Clergy in Zacatecas and Mexico, the two largest provinces. One can send colonial expeditions to Oklahoma and create a protectorate. Racing the USA for colonies can only cause problems, so it might be better to back out. Modernizing the army and getting rid of irregulars might be a good idea. Beating Texas isn't hard. It is keeping the US out of the war that's hard, since if the US enters the war, you will most likely lose. USA can enter as soon as Mexico have a warscore of 1 or higher. There are four options here: 1) The gamey option. 2) The luck based option. 3) Beating the US 4) Giving up. Four is self-explanatory. Give up Texas. What one should keep in mind is that USA cannot enact Manifest Destiny if Mexico owns Houston, Texas. After the war Texas will without a doubt join USA giving it American cores. On the other hand, if Mexico wins the war it will not have problems with USA coming back for it. The first option involves deliberately losing battles to the Texans. The point is that USA cannot intervene if Texas is fighting for its own wargoal. Raise as many squads of infantry as possible while you carry out the first parts of the strategy. Texas is cautious and defensive minded, so one have to drive Mexicos armies towards Texas one at the time. After losing one of the Austin battles, the Texans will chase the group of troops that lost into a territory you own and finish them in another battle, and will begin occupying the region after the battle. Allow them to occupy it. The entire point of this exercise is to get a negative war score with Texas and get them to add a war goal. Once they have added a war goal, the USA can't join the war. This entire process will be slow, mostly in the first phase of building up negative war score, and will take about a year or two. Don't forget to keep an eye on your colonization efforts if possible. Once you have initially overwhelmed the Texan army, don't let up. If you haven't completely demolished them in the initial battle, chase them until they are eliminated. Once they are gone, split your army to occupy all of Texas (don't worry about the war score, even when its positive the USA still can't join due to Texas's war goal), and accept the peace offer to annex Texas. In short, if someone, like the UK, attacks the US, they will be too busy invading Canada to pay attention to Texas. You can obviously cheat by loading as the UK and doing this, of course, but otherwise its pure luck. I had it happen. Once. Other form of lucky win is proposing an alliance to UK, they are in Maybe situation, so you can form an alliance and take them in the war and US will not intervene, but they are unlikely to accept if you try to call them into the war on Texas. The easiest way to do this is to start as though one were doing the gamey option by losing a few battles while recruiting some regular infantry. You will ideally be at -4% warscore by the time the infantry comes up. Now crush the Texan army. If you got your WS properly down, you'll eliminate the army in a few battles and still have negative WS. Spread your army out and begin your occupations at around the same time. When Mexico enters into a positive war score, and the US enters the war. BUT, it takes them time to gear up. One can finish the occupations and annex Texas. Now fight defensively, building up war score until the US accepts a white peace. Technically there is also the 5th option that one can wait until either USA drops to secondary power or Texas rises to great power. Both scenarios are very unlikely and is not really a possibility. Now that the war is over, one can start prioritizing bureaucrats and clergy on the cost of the army. Diplomatically, Mexico has to be on the good side of the US and the UK. Accept alliance offers from both, this will buy you time and protection during this phase and delay the confrontation with the US. USCA is a good target of Conquest, since it holds more Mayan pop, which is accepted in Mexico. Now one has two build up a sufficient industry. For that one needs a better literacy which needs investment. One does probably also need to invest in factories as Mexico lacks capitalists. In technology one can prioritize culture and production, with education and research boosting techs the priority. An additional national focus might be a good idea. Education, especially early on with a clergy promotion focus, will start to slowly raise the literacy acquisition rate. A focus on this early will boost your research later. Confederate States of America. If it gains independence it means a much weaker USA; a weaker USA means a stronger Mexico. A potential ally at the borders of the USA will help when the Manifest Destiny happens. Unfortunately, the CSA often loses the war, but a Mexican ally can be just tip the scales in its favor. Alternatively one can attack CSA before USA manages to end the war. Brunei would also help, with the established of naval ports for resupplying your transports. One does also have to keep a secondary power place. The establishment of colonial expeditions should prioritise Borneo, given its tropical wood and coffee RGOs as well as potential Oil and rubber RGOs in the late game, as well as the Hawaiian islands not yet claimed; these would allow for an expanded supply range for your navy as well a steady supply of fish (for the Canned Food goods your military needs). If the one colonial province in North Borneo is unclaimed, one should also aim to colonise this territory for neater borders, although it would be ill-advised to risk a colonial crisis with other great powers over one province. Depending on whether you retain Texas or not, the late game would look very different. Should Austin fall out of your hands and the Manifest Destiny decision fire, watch out. If Mexico manages to keep hold of Austin, then one can evade all the trouble. From the minute the Manifest Destiny decision fires, or before that if you get enough time, you should aim to have a large modern army, established high-level fortifications, defensive positions and a significant navy (with enough capital ships to match the American fleet). Owing to the immigration bonuses the USA gets, the Americans will outnumber you. France. While the US tends to bowl over their sparse colonial forces in Canada and the UK never brings its full weight to bear on the war, they make an excellent distraction that gives you a much better shot. You'll still be outnumbered, but it will not be as bad and you'll have better odds. Fight defensively and carefully; pick battles in states where you can reduce the combat width and maximise your damage. Tack bonuses as much as possible. Rack up war score and War exhaustion via occupying states with high population and naval blockades. If you can get a successful "Cut Down to Size" peace negotiation, it will be a major boost financially (due to war reparations) and give you a decade of peace. White peaces are easier to reach, but this means a war roughly every 5 years, more or less. You can sometimes make the US be more wary of Attacking you every five years if your war score is near theirs, leading to deterrence. Allying with other Great Powers may also help. Since Mexico has more territory than it can fill with pops and factories anyway, and since it can easily become Great Power as is, one may be compelled to see territorial expansion as unnecessary, and overly risky for limited gains. If you do want to expand, however, this is the time to do it: during truces with the US. The USCA, the Pacific, and the Caribbean tend to be the best bets. If you want to end the endless wars against the US, you'll need to dismantle the thing: look towards freeing the CSA (who retain their cores even in the common event of their loss in the Civil War), take Oregon and Washington, and see what else you can do to diminish them once and for all. Cherokee, as freeing nations will result in less infamy for you while denying the USA their high-industry provinces to weaken their economy. Furthermore, as these states fall under your sphere of influence, they will help increase your industrial score and pops greatly, boosting your score and international standing. In the event you retain Austin and Manifest Destiny does not fire, this frees up resources and opens up more opportunities for you, as the United States is significantly less likely to invade. However, this does not preclude conflict, as competition for influence in Latin America and industry on the world state would prompt tensions. At this stage you should either be a Great Power in your own right or an industrial secondary power utilizing the American sphere of influence for cheap industrial goods. Either way, the Mexican Cession is not likely to happen either by arms or gold. First thing first, you need to beat USA in the Texas war. For opening move. Use the NF to increase bureaucrats. Yes, bureaucrats increase administration efficiency. This increases the amount of tariff you receive, decreases the cost of various maintenance and government purchases, and speeds up the rate of pops promotions and demotions! Ignore provincial administration efficency. What you want is 100% state efficiency which means 1% bureaucrats at the start of the game! Thus the most populous state is most cost-effective for NF in that regard. Try to fund 100% education and 100% administration. The starting army upkeep can be lowered. 100% tax and 100% tariff are strongly suggested. Let artisans change jobs. What holds your economy together early will be your gold mines, not those artisans. Military, disband your starting ships, they won't be needed. Disband your irregular and recruit 5-6 artillery, 1-2 cav and 2-4 inf. You starts with 10 possible brigades, one of them is nahua which will be soon low on soldiers. Consider that be an artillery unit. Do not mobilize until your recruitment is complete. You need your whole army ready to be able to face up with USA. Let Texas siege up provinces in the mean time. Colonize Oregon instead of inland provinces. Oregon is a possible port which is more valuable than the two contestable inland spots. When the army is assembled with the 5 conscripts, organize them into two stacks, one of them is heavy on artillery (1 to 1 artillery- front unit ratio). Begin by liberate the occupied provinces and defeat the Texas army, then siege up Texas then. USA should intervene as soon as warscore is in your favor. US army will invade from the extreme west. Ignore them until you annex Texas. USA should have 3 stacks, your next objective would be the destruction of those stacks. One of them, the conscripts should come from the east, that could be the first one to go down. Use bait and reinforcement tactics. The artillery stack should be the bait, because the artillery from the reinforcement won't deploy correctly in the back, I found out. The Rocky mountains, Utah-Nevada are perfect defensive battle places. Against conscripts, you can go on offensive with the artillery army. Be careful to not overcommit your army, let them rest a month-end if they are low on strength. As soon as US army is destroyed, USA will accept a white peace. It is now up to you to agree or to press on. Arguments against press on : with Texas secured with Mexico, USA will be unable to use manifest destiny (see ACW.txt in the decision files). USA might ally with you some time, and you have secured a friend instead of an enemy. Also, you should have 20-40% war exhaustion from that war when you finally destroyed the US Army. War exhaustion is good for militancy if you want to be a HM government and have reforms early, but is seen to be generally bad on the economy. Also, there is not much good war goals to be added against US. Cut down to size is a bit too expensive for my taste. The only possible good goal would be ask New-York and then face the eternal wrath of the USA and the New Yorkers, who have 30-day rebel releasable Manhattan Commune, be careful on that. When the war is over, you should have achieved 1% national bureaucrats ratio. Now switch to clergy and increase it up to 4% for maximal literacy gains. Then to soldiers to bolster the military score (yes, the soldiers pops increase military score, thankfully for the jingoist conservative party, which is even more effective in VH game mode, meaning more military supplies consumed). When war exhaustion is nearly gone, build 10 clippers and prepare for colonization warfare. Sotoko, Zulu, Sind, Johore (and Vietnam if not allied with China) are all good targets. Don't research military tech. I already have my hands full with chemistry tree down to Medicine, Philosophy, Political thoughts for NF (and also plurality which multiplies research points). The starting tech will be just a good match in the fighting with 1-1 artillery ratio. The Populous colonies provide soldiers who can turn into military score, furthering your rank in the world. USA will try sphere you when the truce is up. But, by that time, Mexico should be soon a GP. When you are a GP, plan ahead, research the naval bases tech earlier in order to have time to build them. MoW are enough to get a lot of colonial points provided you build them early. The ironclads are too expensive in research points. Try to not get into useless war with other GP. The good sphering targets include obviously Brazil. Netherlands and Spain are also good targets, but prepare to fight with influence points in those countries. Uncivs will sometime kick your ambassador out, which can be annoying if that is a Vietnam allied with China. You will be able to fight China with almost only starting military tech (well, you have also the machine guns, but the light weapon tech is too weak compared to artillery tech) when you have 6-8*10 stacks, which usually happen after 1875 with the full colonization of Africa. For the Panama canals, usually USA and UK will fight in influence in Colombia, get in there just after one nation discredits the other (for better intel, turn on the notification on the discredit, go to esc-menu -> message options). The world is your stage, don't count on too much on immigrants when you see USA having so much of them on their side. Brazil, Colombia, Uruguay and even sometime Haiti will be preferred to Mexican gold mines :( Anyway, the world is now the Mexican stage (bolstered with African and possibly Chinese peasants, like any of blobbing games), do as you fit.